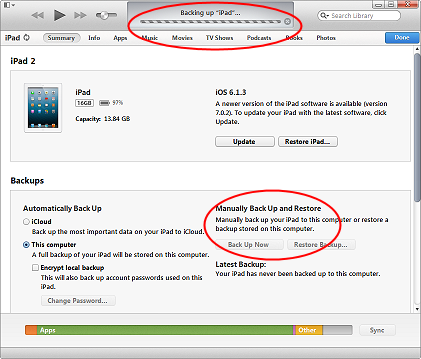 The iTunes device backup screen. If you are a responsible PC user, you know that keeping the backups of your files and devices is a good thing. You probably have a dedicated external drive to which you periodically copy your important files, documents, photos, videos, and so on, to make sure you would still have them when (not if) the hard drive of your computer dies and takes everything it has with it. So, you would probably want to keep the iTunes backup files on that external device, too. Is it possible to set up iTunes for that? 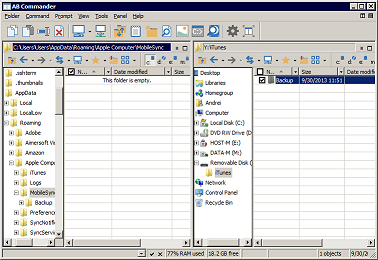 This folder is located on the C: drive, where your Windows and most programs are installed. If you've upgraded your C: drive to an SSD, chances are its size is relatively small, wouldn't it be nice to move the iTunes backup folder to another drive, and free up quite a few GB of space on the C: drive? Since there is no way to configure iTunes to use a different folder for its backup files, we have to use some other method. 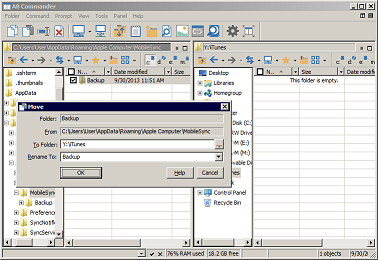 One way of solving this problem is to move the Backup folder to a different drive and then replace the original folder with a junction point, connecting it to the new folder located on a different drive. What is a junction point, you might be wondering? Without going into the technical details too deep, you can think of it as a low-level shortcut, redirecting all traffic from one location to a different folder. How to create junction point? Windows itself does not offer such a command out of the box, so we need to use a third-party utility for that. 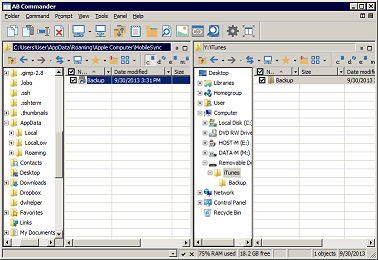 Our file manager and Explorer replacement AB Commander offers an option to create the junction points, so let's use it. The iTunes default backup folder. Of course, replace [User] with your actual user name to get the location on your own computer. 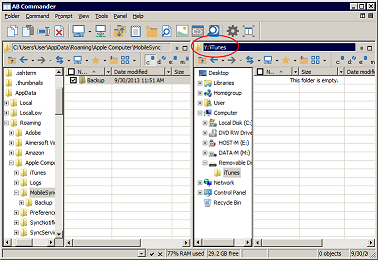 Also, if you can't navigate to the AppData folder because it does not appear in the file listings, turn on the display of the hidden files and folders using Windows Control Panel - Folder Options command, and then press F5 to refresh the file listing in AB Commander. 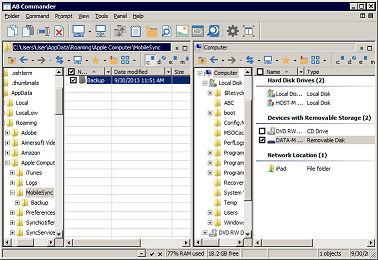 Verify that the Current folder area shows the path to the original folder whether Backup folder used to be, the Create junction point area contains the name Backup (the same as the name of the folder that used to be there), and finally, that the Target folder area contains the new location of the backup folder. That's all! Now it's a good idea to restart the computer, to make sure iTunes would re-initialize with the new information after the restart. Now you can launch iTunes and do a backup of your device. The files in the target folder (Y:\iTunes\Backup in our example) should be updated or created, rather than on the original C: drive. Just attach the external drive Y: and try again, the error should disappear and the iTunes backup should start working as usual.